“Pardon me while I hang out in heaven for the next few days” was my first Instagram photo caption of The Tongsai Bay Resort. When the resort opened its white, pearly gates to me (okay, more like bamboo gates), I entered a world where a relaxing vacation lives in harmony with nature. Ko Samui’s first five star green hotel offered four tranquil days of exceptional service, breath-taking views, delectable food, and a massage to awaken the soul. After living in bustling Bangkok, it was nice to decompress amongst Mother Nature. Upon arrival, my bag was taken and I was greeted at the entrance with a “Sawadee khrup” (hello) and a wai (traditional Thai welcome bow). I was shown a comfy couch, and offered an ice-cold towel and welcome drink to cool down while filling out the check-in card. After the casual check-in, I was escorted by golf buggy to the room. The host gave me a tour of home for the next few days, asked if I needed anything, and then left me in peace with the ocean view. I quickly noticed the bowl of freshly carved fruit and a bottle of white wine on ice with a personalized note welcoming Travelette Katja and me. Lovely to meet you too, Tongsai Bay. 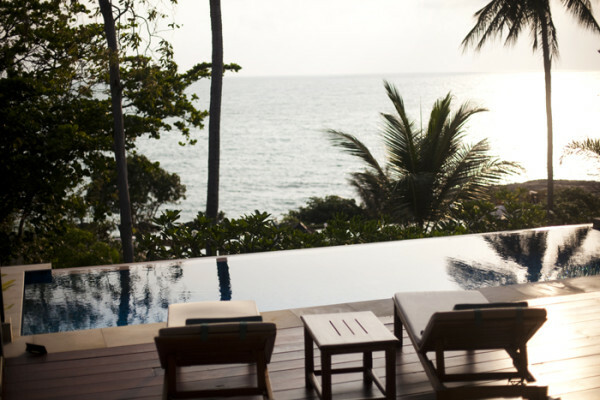 The family-owned resort nestles on 25-acres of secluded, privately owned land that overlooks Tongsai Bay (the resort’s namesake) on the northeastern coast of Thailand’s Ko Samui Island. Only a 10-minute drive from Samui Airport, the location boasts a private beach that was a serene escape from touristy Chaweng, persistent beach vendors, and loud boats and jet skis. When exploring, I was never far from an ocean view, fragrant frangipanis, or a friendly visit by one of the sixty bird species that also call The Tongsai Bay home. For someone who makes their own natural cleaning products, learning about The Tongsai Bay’s green projects was a unique highlight during my stay. 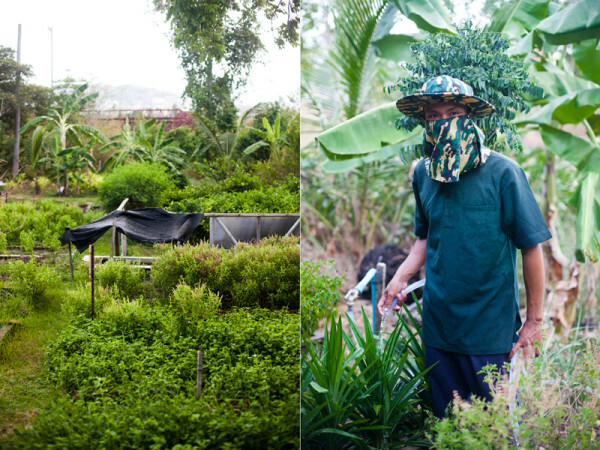 Sustainability is a top priority for the resort and is deeply rooted in its history. In 1986 the late Khun Akorn Hoontrakul visited Tongsai Bay, fell in love, and purchased the land after seven days. He had a huge vision, but also wanted to protect the environment. With that in mind, he constructed his original cottage suites without cutting down a single tree! 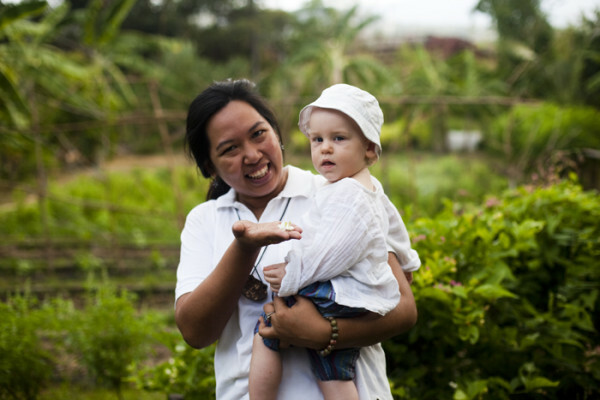 The resort’s Green Project Manager, Meaw, showed us around the organic garden, while explaining the resort’s sustainability. Meaw picked a small green fruit I had never seen before and explained, “This is a Bilimbi. It’s a sour fruit. 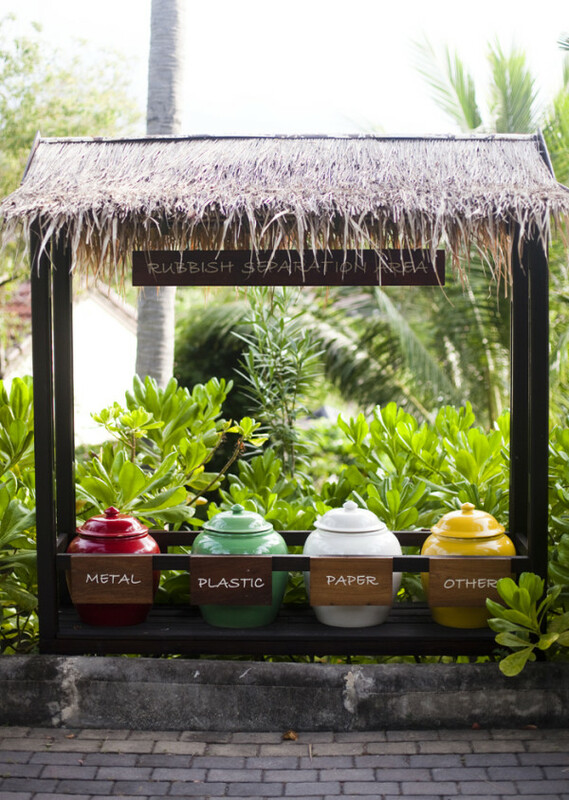 We use it for cocktails, curry, and also ferment it for our organic toilet cleaner.” The resort’s waste is also separated and recycled, or composted at the garden and used as fertilizer. On a walk around the grounds I discovered a huge tank where resort water is treated and then reused to water plants. All soaps, shampoos, and conditioners are natural and in refillable ceramic bottles. 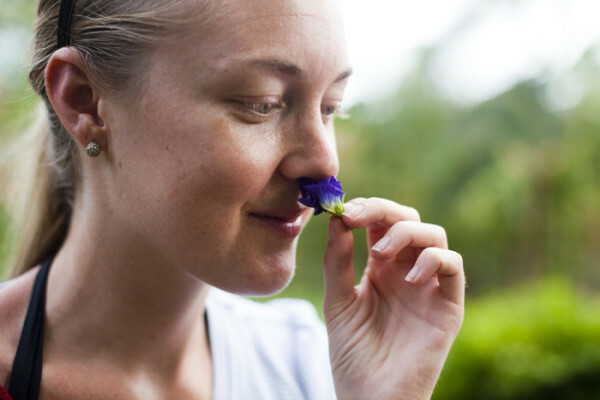 The flora and fauna flourish as pesticides and other harsh chemicals are banned, which allowed for easy evening listening to frogs and insects. I could write a whole article on The Tongsai Bay’s green initiatives, but for now I’ll refer you to this website listing all you need to know. I could have spent all four days at our Tongsai Pool Villa. The room had a luring four-poster bed that induced me into coma-like sleep each night, along with a pillow ordering service. I’ll take the buckwheat pillow, please! The room was open and bright with floor to ceiling windows that let in plenty of natural light. After returning from breakfast each morning, our room was clean. I’d never seen housekeeping that efficient before. 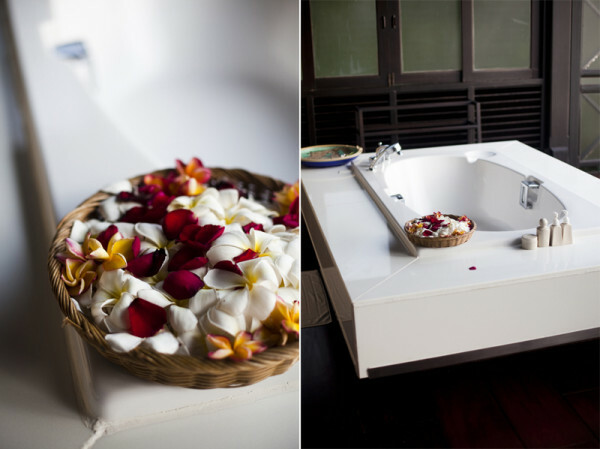 The outside deck featured a bathtub with a basket of fresh frangipanis for a refreshing floral experience, a private pool overlooking the ocean, a comfy gazebo that also doubled as a bed (mosquito net provided! ), and a dining and bar area. The perfect day entailed ordering up room service and hanging poolside while listening to the waves crash. The resort has a large swimming pool for everyone (including a children’s pool) right by the beach, and an adult only half-moon pool with a spectacular view of the bay. “The Beach Boy” crew ensured we had fresh towels, cocktails, and complimentary ice water. At check-in I received the resort’s weekly calendar. The mix of activities included everything from a complimentary Thai culture and beginner language class to a beach cocktail party. Other events had a charge, but seemed well worth the price, including a Thai cooking class or the surf and turf buffet complete with DJ and fire show! For the more active, there are complimentary water sports to get the blood pumping. To adhere to the resort’s green policy, all are non-motorized and include Hobie Cats, windsurfers, paddleboards, kayaks, and snorkeling gear. Don’t know what a Hobie Cat is? No problem, “The Beach Boy” crew to the rescue to offer training! To top off the five star resort experience, I indulged in a massage. I love that the Prana Spa is green and uses only natural products. 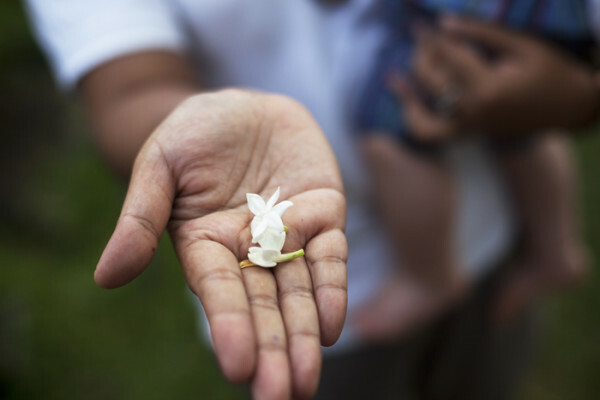 Plus, each massage therapist is trained under The Traditional Thai Massage Revival Foundation’s head trainer. 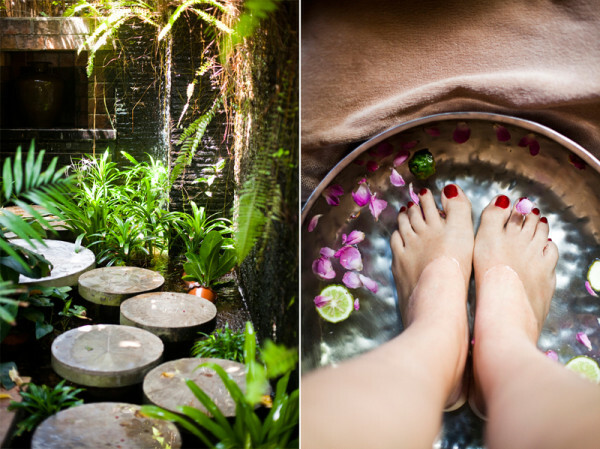 “The professor/instructor is Thai and an expert…he trains all staff in the spa’s techniques,” explained Spa Manager, Ordy. I was greeted with a warm smile, cold towel, and the spa’s homemade Prana herbal drink to sip on while filling out a card to personalize my Thai massage, asking which areas to focus on and how I prefer my massage (hard, medium, or soft). I appreciated this, because I often have to tell massage therapists to ease up since I enjoy a more relaxing experience, versus one that gets all the knots out. I’ve had numerous Thai massages since living in Thailand, and this was by far the best one. To spoil yourself, Prana Spa also offers facials, body scrubs, body masks and wraps, and herbal steam and aromatic baths. The prices are very reasonable. Massages at the beachside gazebo start at 500 THB (approx. $15 USD). 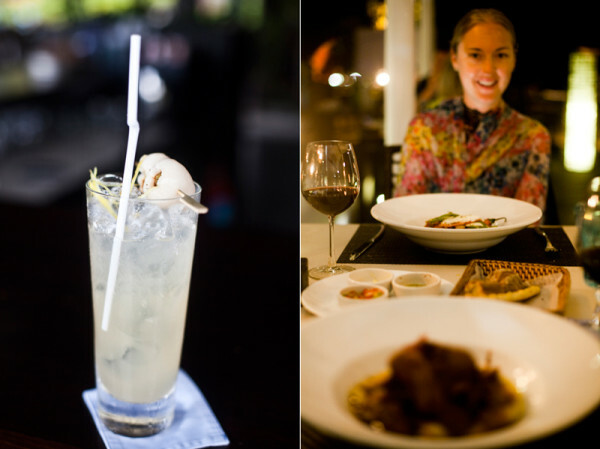 With three restaurants serving up western, Asian, and Thai dishes, coupled with tantalizing cocktails, my taste buds were the only thing not relaxing on this vacation. 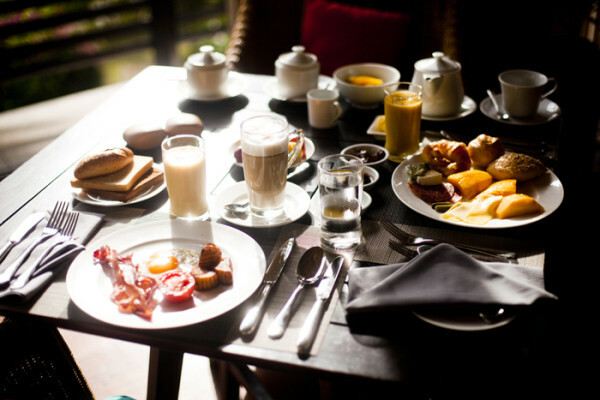 The sumptuous breakfast buffet earned bonus points for happy juice lady, Pu, who always juiced me to a daily energetic start. The breads were baked fresh as I always saw a smile behind the counter kneading dough. I also indulged the many options to spread on my carbs, including honey pouring straight from the honeycomb and basil butter. However, a breakfast wouldn’t be complete without a street food cart to satisfy any case of Thai noodle withdrawals! 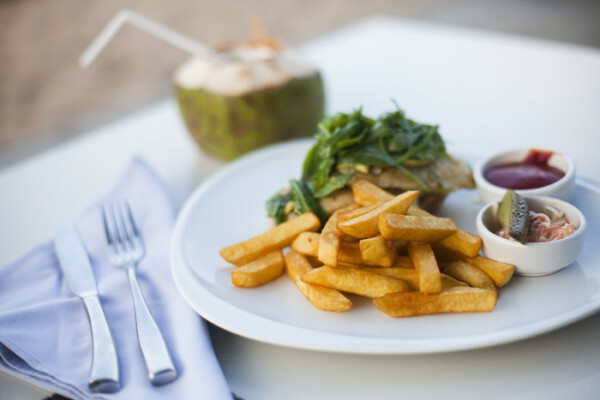 The Po-Lad Beach Bistro offers a relaxing atmosphere and serves everything from Waygu beef burgers to Thai cuisine. Katja and I enjoyed the White Fish, which consisted of a Pangasius filet with rocket greens, pesto sauce, and guacamole, served on rye bread. We paired that with a coconut and had the perfect lunch, beachside! I couldn’t miss Chef Chom’s Thai Restaurant, named after Chef Piengchom Dhabhana who was previously chef at the Royal Thai Household and now a culinary advisor to The Tongsai Bay. Still full from lunch, I opted for a lighter option, The Tongsai Salad. Grilled prawns and squid, green mango, red-yellow peppers, cucumber, tomatoes, and roasted peanuts and cashew nuts, were mixed with young greens and topped with the homemade award-winning Tongsai dressing. 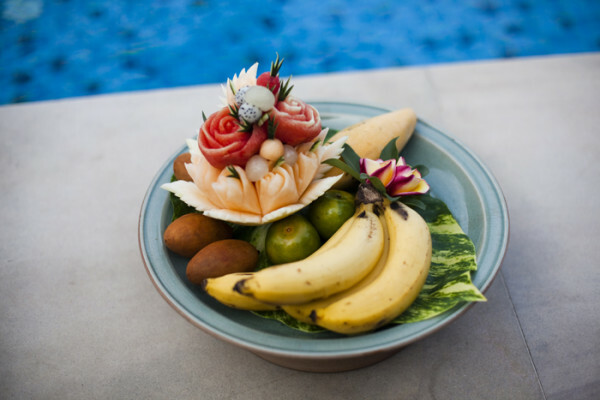 It was served on a banana leaf and enclosed in a colorful Thai woven basket. The restaurant warns that dishes are served just as the locals eat them. So, if you aren’t a fan of spicy, tell your server! Every afternoon, surprise complimentary snacks of freshly baked cookies, sandwiches, and delicious coconut cakes were delivered to our room. It’s the little things that count. I took advantage of burning off the calories from all this deliciousness by exploring the resort’s lush grounds via the many pathways. If you’re in a food coma, the free golf buggies are also ready to pick up at a moment’s notice! At the pool I spoke with a French guest who mentioned it was his second visit. What impressed him was the breakfast juice lady that said, “You’re back again, welcome!” “It’s one thing when the reception welcomes you back since they have a computer, but it’s different when it’s the juice lady who wouldn’t have access to that information,” he commented. On the last day, our flights weren’t until late afternoon. The Tongsai Bay was helpful with offering a late checkout of 2 p.m. Enough time for one last dip in the pool was the cherry on top to complete our relaxing stay at The Tongsai Bay. Katja and I were kindly invited to experience The Tongsai Bay by Green Pearls, a leading source for green hotels. To be a part of the Green Pearls family, hotels must be sustainable and unique while upholding numerous standards. 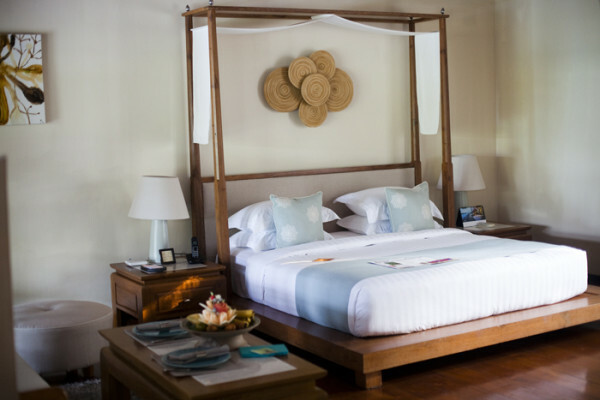 Green Pearls closely monitors a hotel and resort’s environmental protection, local and authentic experiences, social initiatives, and cultural commitment. Learn more about Green Pearls and its collection of handpicked experiences around the world at www.greenpearls.com. Ahhh I want to travel to Thailand so badly! This looks like heaven! Looks like a great place to stay in. I'd love to spend at least a weekend relaxing there. This place looks incredible. I LOVE the whole 'green' approach to this place. You're very luck to have been able to go there! 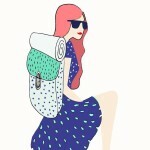 Happy travelling!